Studio package synopsis: Bunny Lake is Missing (1965) offers us director Otto Preminger’s dark view of a London less swinging than it is sinister; the script by John and Penelope Mortimer presents a dodgy kind of thriller, in which the central damsel in distress (Carol Lynley)—a mother who claims that her child has been snatched from school—may be mad, joining the ranks of eccentrics who surround her. Also starring Keir Dullea and Laurence Olivier as a steady-on police inspector, giving one of the more sneakily larcenous performances of his illustrious career. Producer/director Otto Preminger was just coming off of several big productions - Exodus, The Cardinal, In Harm's Way - when he went to England to shoot Bunny Lake is Missing. In many ways it's a reversion to his earlier days when he was making stylish film noir thrillers such as Laura and The Fallen Angel. The central mystery in Bunny Lake (which, for obvious reasons, can't really be discussed here) is fascinating and just a little creepy. In fact the whole movie is creepy starting with the detached performance of Keir Dullea to the behavior of the worst neighbor of all time: Noel Coward's Wilson - a man with big touchy hands and threatening words. But probably the best example is a scene towards the climax set in a Doll Hospital (apparently a real place in London) where a kindly old man (Finlay Currie, from Ben-Hur and many other pictures) presides over a crowded shop full of disembodied and amputated dolls under repair. Skin-crawling stuff from Preminger and his writers. There's an interesting mix of acting going on. Other than the two leads - Carol Lynley and Keir Dullea - most everyone else is from classical theatre and film in England. Top-billed is Laurence Olivier as the dedicated police inspector who doesn't believe anyone...but yet you feel secure knowing he is on the case. Lynley and Dullea's plain language contrasts nicely against these acting heavyweights. 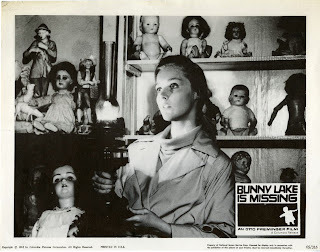 Creepiness personified - the "Doll Hospital"
Looking up some contemporary reviews shows that the film was pretty much dismissed by many critics upon release, but has undergone a serious re-evaluation and is now considered to be one of Preminger's best late-career pictures. Watching the Blu-ray was my first time with the film and I found it engrossing - a solid mystery stylishly filmed. Image quality on this Twilight Time release - in the theatrical Panavision aspect ratio of 2.35:1 and black & white - is outstanding. This is to be expected given that this is a Columbia title transferred and mastered by Grover Crisp and the Sony team. Twilight Time presents it on Blu-ray with a minimum of fuss - I like how their discs load quickly and have no forced previews. The black and white picture is luminous with a rich gray scale and perfect sharpness left intact with no processing artifacts. Sound is the original mono, presented here via DTS-HDMA 1.0, and is equally clean and clear. Having viewed a great number of a Columbia/Sony-mastered titles on Blu-ray it's almost a given that they will be as close to perfect as possible. Rarely have their been any let-downs from them. And Twilight Time appears to leave the master alone when creating their disc and that's how it should be. Twilight Time's early releases did not offer much in the way of special features other than isolated music scores, but they has upped the ante over the past year on many titles. 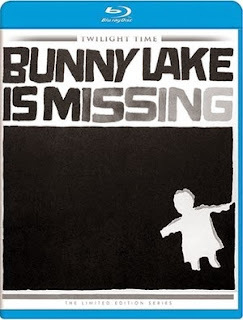 Bunny Lake is no exception as it contains the expected Isolated Score Track (by Paul Glass, in 2.0 stereo) plus an audio commentary with Twilight Time's Julie Kirgo and Nick Redman who are joined by screenwriter Lem Dobbs. Also on hand are three theatrical trailers, including a strange one featuring The Zombies and Preminger himself narrating another. The spoiler-filled liner notes are also by Ms. Kirgo and should be avoided if you haven't seen the film. Savor them later as they are very good. Overall, this Blu-ray is a winner from Twilight Time and comes Highly Recommended. Get it while you can.